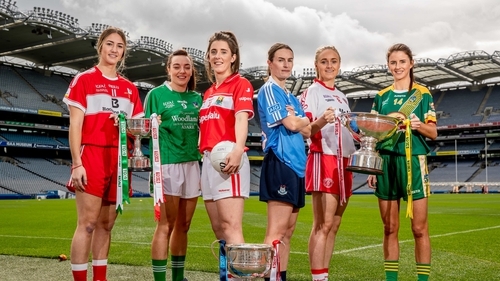 Defending senior champions Dublin put their title on the line against Cork, while intermediate and junior deciders are also down for decision at Croke Park. Live blog of Dublin v Cork on RTÉ.ie and the RTÉ News Now App from 3.30pm. Live commentary on the senior final, Sunday Sport, RTÉ Radio 1, from Brian Carthy and Sharon Courtney, with analysis from Caroline O'Hanlon, Cora Staunton and Niamh Kindlon. Live updates on Meath v Tyrone from Pauric Lodge. Live coverage of the three finals on TG4 from 11.40am. Highlights on The Sunday Game on RTÉ2 from 9.30pm. Any rain will clear the Dublin area early on Sunday morning to leave a day of bright spells and some scattered showers. Afternoon temperatures will range from 16 to 21 degrees in moderating breezes. For more go to met.ie. Can last year's attendance be surpassed? The 2017 decider saw a record attendance of 46,286 at GAA HQ for the meeting of Dublin and Mayo. A week earlier in the men's final, both counties served up a cracking contest and that no doubt helped to increase interest even more in the battle for the Brendan Martin Cup. That said, attendances for the women's finals have been steadily increasing since 2012 when just under 17,000 turned up for the triple-bill. The increase between 2016 and '17 was just over 12,000. LGFA President Marie Hickey is hopeful that Sunday's finals will again attract a sizeable crowd. "It would be wonderful to get close to last year's mark," she said when speaking to The Examiner. "Cork have been very busy with the camogie last weekend so I’m sure they will be all getting on the ticket sales this week and we will hopefully see a good response there as well. "I also think that we have done a lot of work in promoting the finals and promoting the games in clubs throughout the country and not just in participating counties. So we had a larger number of supporters from non-participating counties than ever last year, which was heartening to see." After winning only their second All-Ireland crown last September, Mick Bohan's Dublin followed that up when winning a first league title last May. They are the form team in the country at the moment, but Cork will be keen to regain top billing as they target fifth consecutive win over the Dubs on final day. Cast your mind back to the 2014 showdown, a day when Cork came from ten points down to claim the spoils by the bare minimum. In 2016, the Munster side won an 11th All-Ireland in 12 years, but a Carla Rowe point for Dublin that was incorrectly waved wide was the main taking point afterwards. Hawk-Eye was not operable that day (it will be on Sunday) for the women's game as Cork eventually ran out one-point winners. Dublin, not surprisingly, will be determined to defend their crown, though defeating a side who gave them much heartache in recent seasons will make any victory that bit sweeter. A point picked up on by Dubs forward Nicole Owens, who told RTÉ Sport: "I have lost three finals to them and therein lies the challenge. "It’s the best two teams who make the final and we strongly believe that if we play to the best of our abilities and follow our game plan that we are the best team in the country." Cork boss Ephie Fitzgerald has played down talk of a rivalry, sating that it's "media talk". He added: "Whether Cork have beaten Dublin means nothing; this is a new game. I don't think past results in anyway play a part and an All-Ireland final takes on a life of its own. Sunday’s game is another game. "We have Ciara O’Sullivan who has eight or nine All-Ireland medals and she is not thinking about anything else other than proper preparation and making sure she is right for the game." Cork have won 11 All-Ireland titles and victory on Sunday will see them head the roll of honour ahead of Kerry. In their five championship outings this year, including the Leinster final, Dublin have amassed 20-66, or an average of 4-13 per game. Of that combined tally, captain Sinéad Aherne has chipped in with 4-24 along the way. Skipper Ciara O’Sullivan has also contributed handsomely, landing 6-07 in the 2018 championship. After last year's loss to Tipperary, Tyrone will be determined to go one better when they face a Meath outfit, who are appearing in their first intermediate decider. The Red Hand stormed through the Ulster championship and All-Ireland qualifiers with ease – but have had two stern tests against Wexford and Sligo in the knockout stages. A comprehensive semi-final win for the Royals over Roscommon at Dr Hyde Park sees them head to Croker in fine spirits. Their manager Eamonn Murphy keeps faith with the side that started against the Rossies. Tyrone boss Gerry Moane has opted for three changes in personnel following the Sligo win – as goalkeeper Shannon Lynch, Niamh McGirr and Emma Mulgrew come in for Laura Kane, Aimee Daly and Christiane Hunter. It's a repeat of the 2010 decider where Limerick claimed junior honours. Louth's last success was in 2015. The Wee County have named an unchanged team following their dramatic semi-final victory over Derry, while Áine McGrath has been handed a start for Limerick, who beat London in their last-four clash, as Caroline Hickey drops to the bench.